To some extent, I’ve always been cogniscent of the fact that I’ve gravitated towards of a variety of indicators for the success of anime, rather than just word of mouth, because I have idiosyncratic tastes and using said variety of indicators helps illustrate that the case for or against many shows isn’t as clear-cut as many narrative-spinners would have you believe. For the record, If there’s a worse anime blogger than Rick Reilly is a sports columnist, I’ve never met them. But I’ve read too many terrible columns by sanctimonious 70-year-old baseball writers about how Yasiel Puig has zero class and too many terrible columns by sanctimonious anime bloggers about how Kill La Kill is somehow “saving” an anime* industry that isn’t actually dying or lacking for fresh content not to see a lot of similarities between the two groups. I’m not saying that all writers who take a critical perspective on anime are like this, but far too many of them are more interested in grinding an axe against a genre rather than actually having a serious discussion about it. 1. How much I enjoy it. 2. How well it performs commercially, usually in disk sales but potentially in other categories. It has to at least be a lock argument for having had break even sales. 3. The presence of a persistent group of (for lack of a better word) haters. Not just people who sort-of dislike and avoid it, but people who can’t resist taking paragraph-long potshots at it any time it gets mentioned. This means that, as good as Attack on Titan was, it’s not a max-entertainment bandwagon. No one of any consequence particularly hates the show, and it’s just done really well. By contrast, Girls und Panzer was a near-perfect bandwagon show, putting up megahit numbers in the face of a number of vocal and hilariously ineffectual critics (it would be on my shortlist already if I weren’t currently watching it). There is really nothing sweeter in fandom than watching a show pile up vocal critics and subsequently both be good and sell well in spite of them. This post contains my personal shortlist of series I’ve had the privilege of being a fan of long enough to watch them do the Shaq thing and dunk all over the place. To clarify before I actually get to the list, I don’t believe it’s a bad thing to hold any particular set of opinions. I do believe it’s a bad thing to constantly spend time talking scrap about stuff you don’t enjoy, and more generally about the way things are, rather than actually doing something about it. If you’re so upset about the majority of anime that get made nowadays, put up and post links to the BDs of the series you do like on your blog, or just buy them yourself. It’s trivially easy to use amazon for that sort of thing in this day and age. I find anime episode titles lined up to be aesthetically pleasing. There’s an art to picking a good title that really speaks to the content of the episode. Here I tired to keep things simple, and limited myself to one episode per show to keep Gatchaman Crowds and the non-racist parts of Space Brothers from dominating the chart and keeping some other interesting ones out. I haven’t been writing much on it lately, but I’m a firm believer on the power of a soundtrack (and good sound direction) to either give a show the last little push it needs to get to 10/10 quality or kneecap a show that could’ve been a contender. With that in mind, here are 10 tracks from 10 different 2013 anime I thought turned particular scenes into memorable standouts. 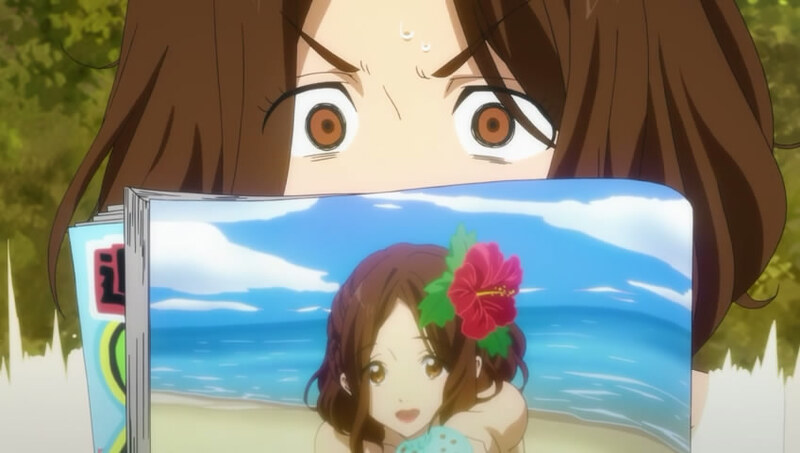 The two biggest unresolved plot threads of Free going into the final episode (Rin’s suspension from the relay team and the effects on his and Haru’s burgeoning rivalry) closely shadowed one of the show’s bigger strengths (its strong cast) but weren’t exactly playing to the show’s big strength; its kinetic visual sense. Given that, the direction the ending went wasn’t a huge shock. Though it was admittedly not one hundred percent something that I had anticipated, it still went down the right pipe. Free didn’t let up on the details as per usual. It might be only the second or third time I’ve seen an anime point out the poor quality of it’s written Engrish, a stickem take on a cliche that was further justified by it being written by a bunch of jock high schoolers. It packed in a little extra bit of realism by showing how information technology can be used to boost athletic performances. And it made the most of a nabe spill, resolving the subplot foremost in the minds of the viewers. But the real reason Free sold out at the majority of online retailers is that it packs a good dramatic cast, and said cast was on display as well, approaching something that the show hadn’t really confronted up till now. The central arc of the show deals with the rivalry between Rin and Haru with roots dating back to when they were in the same swim club with Matoto and Nagisa. So where does Rei, the new kid who’s now friends with the latter three but just got involved 3 months ago fit into the equation? The more the series draws to its conclusion, the closer it resembles a cross between an 80s sports movie and a less-minimalistic Touch. It’s got the works; last-second comeback plays, a little bit of environment for the small town, plenty of memorable quotes. Not to mention the chat Haru and Makoto had while looking out at the coastline which finally made things click for the former. 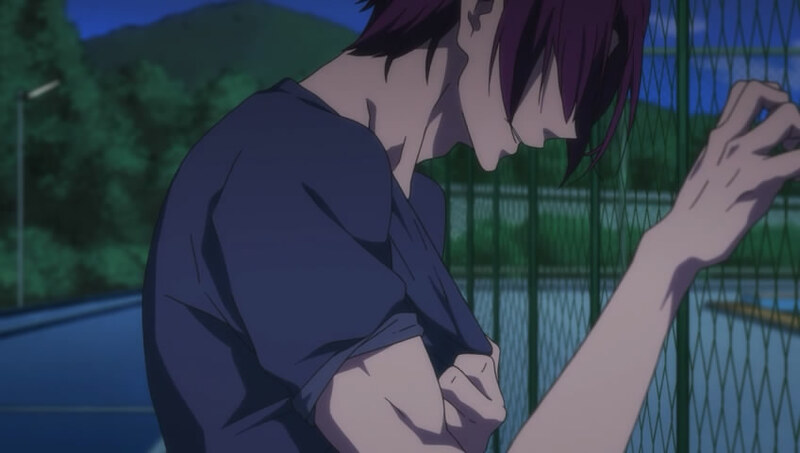 Nor that recollection scene Rin had at the old pool, choking down tears for something he could’ve kept but threw away. Nor the still-excellent background music that played during it. So the show did end up relying on the rematch, but it did it in a bit of a roundabout way that allowed for more emotional investment in the interim. Since Gou did the signups without telling any of the guys, we got a lot of footage of them trying their best in individual events. They may all have eventually lost, but they did so in the seven-game Conference Semifinals series kind of way, where one lucky bounce (or something as trivial as Rei’s goggles staying put) would have been enough to turn all of that into a win. In other words, losses providing the perfect narrative building blocks of a relay challenge the next day. 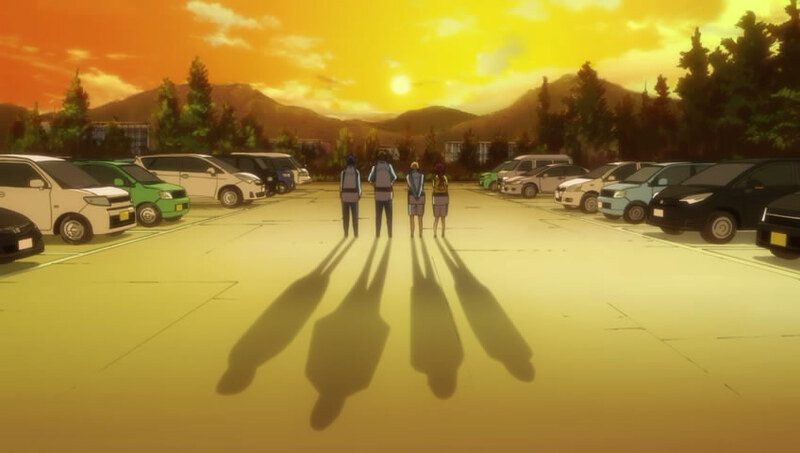 In general, this was a pretty solid buildup episode, highlighting Haru and Rin’s quietly intensifying rivalry, the comradeship of the four main characters, and a bit of Rin’s external motivation. Oh yeah, and it wasn’t actually a buildup episode. They literally powered through the race, something I was sure would take at least another episode getting to, with ruthless efficiency and great effect. Showing is superior to telling, but not all showings are created equal. One of the ways to tell a high-class pro director from a replacement-tier one is the way they make a situation clear with the first snap of the camera. Case in point: those first 3 seconds of that shot after Haru saved Makoto. The way one set of feet was dragging and the other was limp immediately spelled out what was going down. Mix in effective not-use of music (just rain and heavy breathing), and you get an immediate impression of the state Makoto was in. It was a bit of imagery that felt like something adapted from an award-winning manga, except Free is a novel adaption that had to make its own storyboards.